Each year our favorite boat and motor manufacturers roll out their new models. If you are looking for the next boat, there are dozens of choices in every category, with options you may never have thought of. For 2015, expect higher quality materials, more comfort and better fuel economy. Here, with your first look at what’s hot and what’s new, is your Game & Fish guide to the new boats and motors of 2015. New for 2015 comes the Alumacraft Tournament Pro 185 Sport, an 18-foot, 3-inch boat with a beam of 97 inches and a depth of 43 inches. The T-Pro is rated for a maximum 175 horsepower and a capacity of six people. This boat tips the scales at 1,680 pounds with a fuel capacity of 34 gallons and two livewells. Other features include bow and port rod storage, lockable storage, accessory mounts, custom dash and gauges. What We Like: We like the comfortable cockpit, lights and amenities. What We'd Change: We'd like to see interior LED rope lighting for night fishing. Bass Cat's new Caracal is built on a super fast streamlined 19'-8" hull with an emphasis on room for fishing, storage and more integrated fishing features. The 96-inch beam carries further towards the bow, making room for a unique net/ruler/tool holder system along the port side rail that flows into the rod rack. Maximum horsepower is 225 with a fuel capacity of 41 gallons. What We Like: On plane or at rest, this boat is super stable. Those of us that have been around awhile remember Clackacraft's '80s-era Magnum. 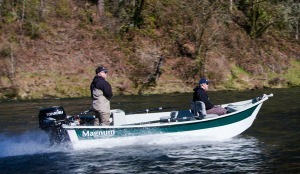 The new 17' Magnum is really something old, something new. Power it upriver then shut off the motor and then get on the oars and slide into your spot. Then power upriver again. It's a power boat and a drift boat, well suited for pulling plugs, side-drifting and nymphing. This super shallow running boat weighs in at 600 pounds and, loaded with four passengers, with the 50/35 jet can get up on plane quick. Recommended motor is a 35hp Tohatsu jet. Standard package includes boat, trailer, oars, rower seat and a megabox up front with two padded passenger seats. What We Like: It's a jet boat and a drift boat in one. What We'd Change: We'd like to see rod holders and a bit more storage. Crestliner's latest is a new, big water boat with all-welded aluminum construction. Inside, a wrap-around console, a 20-gallon stern livewell, starboard storage, portside rod rack and professional quality seats make this boat comfortable enough to fish all day. Rod tubes beneath the floor allows safe stowage of up to six more eight-foot rods. Overall, the boat tapes at 20 feet, 10 inches and has a beam of 98 inches. Maximum depth is 46 inches. 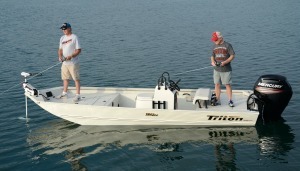 Weight capacity is 2,100 pounds and the Authority is rated for a 225hp motor. What We Like: We like the toe holds engineered into this boat. G3's new Angler V192 SF is built on a 19-foot, two-inch three-piece riveted keel with double plated (.100 gauge) bow and bottom. Standard features include high back fishing seats, six lockable storage boxes, a fiberglass reinforced console with wraparound windshield, Faria gauges, a center rod locker, two livewells and a 40 gallon fuel tank. Rated for 200 horsepower, the boat's beam is 96 inches and the transom height is 25 inches. What We Like: We like the Alpine Bluetooth stereo. What We'd Change: We'd put some toe holds in up front. For 2015, G3 added a new model, the Sportsman 17, to their line of aluminum bass boats. Measuring in at 17 feet, 10 inches with a 92-inch beam, it is built on a welded two-piece aluminum hull with an aluminum transom, rated for a maximum 90hp. Standard features include a Minn Kota Edge 55 trolling motor, custom tilt wheel and a new suspended console. The Sportsman has a 33 gallon divided livewell, an in-dash Garmin Echo 101 fish finder, nine-foot rod storage and three-across seating. The boat comes on a Bear custom trailer. What We Like: We like how this boat fishes in close quarters. What We'd Change: We'd add more task lighting. Lund's 1850 Impact XS is built for speed with the maneuver- and fishability of a smaller boat for bass, walleye, musky and crappie. It measures 18 feet, 7 inches with a 94-inch beam, a cockpit depth of 38.5 inches and a transom height of 25 inches. Flip-up seats and a ski pylon make it even more versatile. Fish it all weekend without going back to the pump, the fuel capacity is 32 gallons. The maximum load capacity is six persons with a total capacity of 1,600 pounds. The suggested power range is 115 to 150 horsepower. What We Like: We like the seating capacity. What We'd Change: We'd consider the crappie option with a bow multi-base and bait station. 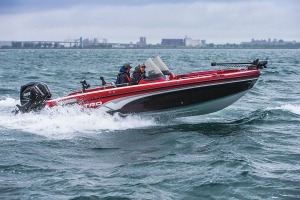 An 18-foot class multi-species boat built with the deepwater walleye, pike and musky angler in mind, the Nitro ZV 18 comes standard with a 150hp four-stroke Mercury. It comes with a deep-V hull to handle choppy water. Features include a 26-gallon livewell, a 5.5-gallon bow baitwell and a new port-side mounted net holder. Helm and passenger seats are adjustable, there is a bike seat with pedestal and a fold-down molded fishing seat with pedestal. What We Like: We like how this boat handles big northern lakes. What We'd Change: We'd upgrade to at least 80-pound thrust on the trolling motor. This newest in the series is built with composite construction, is rated for a maximum of 225 horsepower outboard and can hold 40 gallons of fuel. Phoenix's 919 Pro XP is 19 feet, 8 inches long with a 96-inch beam and weighs in at 1,800 pounds. At midship are two custom bucket seats. The passenger gets a grab handle and a foot rest/brace while the captain has Teleflex hydraulic tilt steering and Teleflex trim as well as a Hot Foot throttle with adjustable slide. Instrumentation includes tach, speedo, volt, trim, water pressure and fuel gauges. Coolers, a livewell, rod stowage and other storage options are accessed with stainless locking latches. What We Like: We like how this boat handles rough water. What We'd Change: We'd go for the padded deck option. This Ranger measures 19 feet, 8 inches, is rated for 225 horses and is available with a wide range of customizable options. The 619FS Fisherman has a 100 inch beam and a 51-gallon fuel tank. Fishability is enhanced with a keel system that keeps more of the hull in the water while fishing and less of it exposed to wind. It is available in single- and dual-console configurations as well as with plexiglass or walk-through windshields. A new soft touch skid-resistant interior is supposed to provide better cushioning while drying faster. The center rod locker can accommodate rods up to 8 feet, 6 inches long. What We Like: We like the custom matched trailer. What We'd Change: We'd think about putting a removable rear deck on this one. Triton's new 20 TRX measures in at 20 feet, five inches, with a 95-inch beam. Rated for 170 to 250 horsepower, this boat weighs 1,790 pounds, can hold 46 gallons of fuel. Livewell capacity is 41 gallons, the rear storage/baitwell holds 84 quarts, the ice chest is 51 quarts. All compartment lighting and integrated bow navigation lights are LEDs. The trailer comes with aluminum diamond tread plate and front and rear lighted step pads, custom wheels, disc brakes and a swing tongue. Triton's 1862 CC Bay is a center console boat with all aluminum floors and decks and an approximate hull weight of 1,010 pounds. Rated for a capacity of six people, the recommended horsepower range is 25 to 90. A wide range of matched outboards are available with factory rigging. Overall length is 18 feet, four inches with a beam of 90 inches and a bottom width of 62 inches. Features include aerated livewell, custom fiberglass console with tachometer, fuel gauge and easy touch switching. What We Like: We like the lightweight and utility of this boat. What We'd Change: We'd like to see LED task lighting. Honda Marine's single-cylinder BF2.3 weighs in at 29.5 pounds, the lightest four-stroke outboard motor in America. Features include shallow water drive, twist grip throttle and a front-mount carrying handle. Rated for 2.3 horsepower, it uses forced air cooling and a centrifugal clutch. Since this motor doesn't require a water pump, weed clogging and drainage are not an issue. 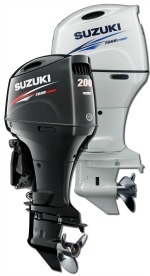 New from Suzuki is a four-stroke, four-cylinder outboard designed with a direct air intake and variable valve timing. Suzuki uses lean burn control for more efficiency and knock, O2 and water detection sensors to monitor and control internal engine parameters. It weighs in at 498 pounds. Troll mode is available as an optional feature. Driver can control speed in 50 RPM increments. Tohatsu's 250HP offering is built on a large displacement 24 valve 3.6 liter V6 Honda which boasts variable valve timing and lift electronic control for a broader, flatter torque curve. Programmed fuel injection delivers precision control of fuel and air mixtures to each cylinder for easy starts and throttle response. Get there faster, cleaner and quieter with 30-to 40-percent more efficiency than a two-stroke. The new V MAX SHO 175 is Yamaha's latest offering in a lightweight, four-stroke, efficient, clean, quiet 175-horsepower outboard. Yamaha uses variable camshaft timing to advance and retard the angle of the intake camshaft for better throttle response in the low- and mid-rpm ranges.